Along with red bone marrow, the lymph nodes are centers for lymphocyte production. Lymphocytes attack viruses, bacteria, and other parasitic cells that are brought to the lymph nodes by lymph in the lymphatic vessels. Lymph nodes are important for the proper functioning of the immune system, acting as filters for foreign particles and cancer cells. Macrophages in the lymph nodes engulf and destroy foreign substances, damaged cells, and cellular debris. Lymph nodes do not have a detoxification function, which is primarily dealt with by the liver and kidneys. Monitoring body fluids (immune surveillance), a function performed by lymphocytes and macrophages. A capsule of connective tissue encloses each lymph node and subdivides it into compartments. Lymph nodes contain large numbers of lymphocytes (B cells and T cells) and macrophages that fight invading microorganisms. Masses of B lymphocytes and macrophages in the cortex are contained within lymphatic nodules, also called lymphatic follicles, the functional units of the lymph node. The spaces within a node, called lymphatic sinuses, provide a complex network of chambers and channels through which lymph circulates. Lymph nodes are generally in groups or chains along the paths of the larger lymphatic vessels throughout the body and each group drains a specific area of your body, but are absent in the central nervous system. 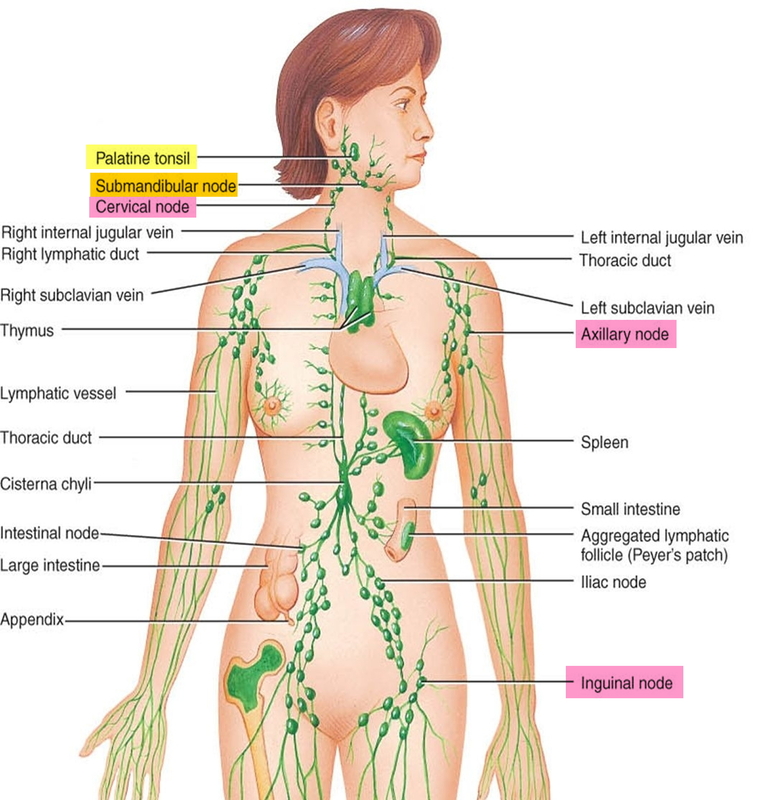 Figure 1 shows the major locations of lymph nodes. You may be more likely to notice swelling in certain areas, such as in the lymph nodes in your neck, behind your ears, under your chin, in your armpits and in your groin. The site of the swollen lymph nodes may help identify the underlying cause. Lymph nodes vary in size and shape, but are usually less than 2.5 centimeters long and somewhat bean-shaped (Figure 2 and 3). Blood vessels join a lymph node through the indented region of the lymph node, called the hilum. The lymphatic vessels leading to a lymph node (afferent vessels) enter separately at various points on its convex surface, but the lymphatic vessels leaving the lymph node (efferent vessels) exit from the hilum. The lymphatic system is a vast collection of cells and biochemicals that travel in lymphatic vessels, and the organs and glands that produce them. The lymphatic system includes a network of vessels that assist in circulating body fluids, so it is closely associated with the cardiovascular system. Lymphatic vessels transport excess fluid away from interstitial spaces in most tissues and return it to the bloodstream (Figure 4). Without the lymphatic system, this fluid would accumulate in tissue spaces. Special lymphatic capillaries, called lacteals, are located in the lining of the small intestine. They absorb digested fats and transport them to the venous circulation. The lymphatic system has a second major function— it enables you to live in a world with different types of organisms. Some of them live in or on the human body and in some circumstances may cause infectious diseases. Cells and biochemicals of the lymphatic system launch both generalized and targeted attacks against “foreign” particles, enabling the body to destroy infectious agents. This immunity against disease also protects against toxins and cancer cells. When the immune response is abnormal, persistent infection, cancer, allergies, and autoimmune disorders may result. The larger lymphatic vessels lead to specialized organs called lymph nodes. After leaving the lymph nodes, the vessels merge to form still larger lymphatic trunks. Figure 4. Schematic representation of lymphatic vessels transporting fluid from interstitial spaces to the bloodstream. Depending on its origin, lymph enters the right or left subclavian vein. Lymph is essentially tissue fluid (interstitial fluid) that has entered a lymphatic capillary. Lymphatic capillaries are microscopic, closed-ended tubes that originate in the interstitial spaces of most tissues. Thus, lymph formation depends upon tissue fluid formation. The walls of lymphatic vessels are similar to those of veins, but are thinner. Like some peripheral veins, lymphatic vessels have valves that help prevent backflow of lymph. Filtration from the blood plasma normally exceeds reabsorption, leading to the net formation of tissue fluid. This accumulation of tissue fluid increases the tissue fluid hydrostatic pressure, which moves tissue fluid into lymphatic capillaries, forming lymph. Lymph returns to the bloodstream most of the small proteins that passed through the blood capillary walls. At the same time, lymph transports foreign particles, such as bacteria and viruses, to lymph nodes. The hydrostatic pressure of tissue fluid drives lymph into lymphatic capillaries. However, muscular activity largely influences the movement of lymph through the lymphatic vessels. Lymph within lymphatic vessels, like venous blood, is under relatively low hydrostatic pressure and may not flow readily through the lymphatic vessels without help from contraction of skeletal muscles in the limbs, contraction of the smooth muscle in the walls of the larger lymphatic trunks, and pressure changes associated with breathing. Contracting skeletal muscles compress lymphatic vessels. This squeezing action moves the lymph inside lymphatic vessels. Valves in these vessels prevent backflow, so lymph can only move toward a collecting duct. Additionally, smooth muscle in the walls of larger lymphatic trunks contracts rhythmically and compresses the lymph inside, forcing the fluid onward. Breathing aids lymph circulation by creating a relatively low pressure in the thoracic cavity during inhalation. At the same time, the contracting diaphragm increases the pressure in the abdominal cavity. Consequently, lymph is squeezed out of the abdominal vessels and forced into the thoracic vessels. Once again, valves in lymphatic vessels prevent lymph backflow. The continuous movement of fluid from interstitial spaces into blood and lymphatic capillaries stabilizes the volume of fluid in these interstitial spaces. Conditions that interfere with lymph movement cause tissue fluid to accumulate within the interstitial spaces, producing edema or swelling. Edema may develop when surgery removes lymphatic tissue, preventing lymph flow. For example, a surgeon removing a cancerous breast tumor may also remove nearby axillary lymph nodes to prevent associated lymphatic vessels from transporting cancer cells to other sites. Removing this lymphatic tissue can obstruct drainage from the upper limb, causing edema. The body has approximately 600 lymph nodes, but only those in the submandibular (under the jaw), axillary (armpits) or inguinal (groin) regions may normally be palpable in healthy people 2). The term “swollen glands” refers to enlargement of one or more lymph nodes. In general, lymph nodes greater than 1 cm in diameter are considered to be abnormal. The medical name for swollen lymph nodes is lymphadenopathy 4). In a child, a node is considered enlarged if it is more than 1 centimeter (0.4 inch) wide. There are various classifications of swollen lymph nodes (lymphadenopathy), but a simple and clinically useful system is to classify swollen lymph nodes as “generalized” if lymph nodes are enlarged in two or more noncontiguous areas or “localized” if only one area is involved. Distinguishing between localized and generalized lymphadenopathy is important in formulating a differential diagnosis. In primary care patients with unexplained lymphadenopathy, approximately three fourths of patients will present with localized lymphadenopathy and one fourth with generalized lymphadenopathy. Swollen lymph nodes usually occur as a result of exposure to bacteria or viruses 5). When swollen lymph nodes are caused by an infection, this is known as lymphadenitis. Rarely, swollen lymph nodes are caused by cancer. Superficial lymphatic vessels inflamed by bacterial infection appear as red streaks beneath the skin, a condition called lymphangitis. Inflammation of the lymph nodes, called lymphadenitis, often follows. In lymphadenopathy, affected lymph nodes enlarge and may be quite painful. In some cases, the passage of time and warm compresses may be all you need to treat swollen lymph nodes. Treatment of lymphadenitis depends on the cause. Other cancers that have spread (metastasized ) to lymph nodes. Abscess formation. An abscess is a localized collection of pus caused by an infection. Pus contains fluid, white blood cells, dead tissue and bacteria or other invaders. An abscess may require drainage and antibiotic treatment. Bloodstream infection (bacteremia). A bacterial infection anywhere in your body can progress to sepsis, which is an overwhelming infection of the bloodstream. Sepsis may progress to organ failure and death. Treatment involves hospitalization and intravenous antibiotics. Many lymph nodes are located in your head and neck region. Lymph nodes that frequently swell are in this area, as well as in your armpits and groin area. Seek immediate medical care if you’re having difficulty swallowing or breathing. Blood tests. Depending on what your doctor suspects is causing your swollen lymph nodes, certain blood tests may be done to confirm or exclude the suspected underlying condition. The specific tests will depend on the suspected cause, but most likely will include a complete blood count (CBC). This helps evaluate your overall health and detect a range of disorders, including infections and leukemia. Lymph node biopsy. Your doctor may have you undergo a biopsy. He or she will remove a sample from a lymph node or even an entire lymph node for microscopic examination. When lymphadenopathy is localized, the clinician should examine the region drained by the nodes for evidence of infection, skin lesions or tumors. Note: STDs= sexually transmitted diseases. Size. Nodes are generally considered to be normal if they are up to 1 cm in diameter; however, some authors suggest that epitrochlear nodes larger than 0.5 cm or inguinal nodes larger than 1.5 cm should be considered abnormal 11). Little information exists to suggest that a specific diagnosis can be based on node size. However, in one series10 of 213 adults with unexplained lymphadenopathy, no patient with a lymph node smaller than 1 cm2 (1 cm × 1 cm) had cancer, while cancer was present in 8 percent of those with nodes from 1 cm2 to 2.25 cm2 (1 cm × 1 cm to 1.5 cm × 1.5 cm) in size, and in 38 percent of those with nodes larger than 2.25 cm2 (1.5 cm × 1.5 cm). In children, lymph nodes larger than 2 cm in diameter (along with an abnormal chest radiograph and the absence of ear, nose and throat symptoms) were predictive of granulomatous diseases (i.e., tuberculosis, cat-scratch disease or sarcoidosis) or cancer (predominantly lymphomas) 12). These studies were performed in referral centers, and conclusions may not apply in primary care settings. Pain/Tenderness. When a lymph node rapidly increases in size, its capsule stretches and causes pain. Pain is usually the result of an inflammatory process or suppuration, but pain may also result from hemorrhage into the necrotic center of a malignant node. The presence or absence of tenderness does not reliably differentiate benign from malignant nodes 13). Consistency. Stony-hard nodes are typically a sign of cancer, usually metastatic. Very firm, rubbery nodes suggest lymphoma. Softer nodes are the result of infections or inflammatory conditions. Suppurant nodes may be fluctuant. The term “shotty” refers to small nodes that feel like buckshot under the skin, as found in the cervical nodes of children with viral illnesses. Matting. A group of nodes that feels connected and seems to move as a unit is said to be “matted.” Nodes that are matted can be either benign (e.g., tuberculosis, sarcoidosis or lymphogranuloma venereum) or malignant (e.g., metastatic carcinoma or lymphomas). Location. The anatomic location of localized adenopathy will sometimes be helpful in narrowing the differential diagnosis. For example, cat-scratch disease typically causes cervical or axillary adenopathy, infectious mononucleosis causes cervical adenopathy and a number of sexually transmitted diseases are associated with inguinal adenopathy (Table 3). Supraclavicular lymphadenopathy has the highest risk of malignancy, estimated as 90 percent in patients older than 40 years and 25 percent in those younger than age 40 14). Having the patient perform a Valsalva’s maneuver during palpation of the supraclavicular fossae increases the chance of detecting a node. Lymphadenopathy of the right supraclavicular node is associated with cancer in the mediastinum, lungs or esophagus. The left supraclavicular (Virchow’s) node receives lymphatic flow from the thorax and abdomen, and may signal pathology in the testes, ovaries, kidneys, pancreas, prostate, stomach or gallbladder. Although rarely present, a paraumbilical (Sister Joseph’s) node may be a sign of an abdominal or pelvic neoplasm 15). In patients with generalized lymphadenopathy, the physical examination should focus on searching for signs of systemic illness. The most helpful findings are rash, mucous membrane lesions, hepatomegaly, splenomegaly or arthritis (Table 3). Splenomegaly and lymphadenopathy occur concurrently in many conditions, including mononucleosis-type syndromes, lymphocytic leukemia, lymphoma and sarcoidosis. EA = early antibody; VCA = viral capsid antigen; CMV = cytomegalovirus; HIV = human immunodeficiency virus; PPD = purified protein derivative; RPR = rapid plasma reagin; HBsAg = hepatitis B surface antigen; EMG = electromyelography. In most patients, lymphadenopathy has a readily diagnosable infectious cause. A diagnosis of less obvious causes can often be made after considering the patient’s age, the duration of the lymphadenopathy and whether localizing signs or symptoms, constitutional signs or epidemiologic clues are present. When the cause of the lymphadenopathy remains unexplained, a three- to four-week observation period is appropriate when the clinical setting indicates a high probability of benign disease. Infection. The most common treatment for swollen lymph nodes caused by a bacterial infection is antibiotics. If your swollen lymph nodes are due to an HIV infection, you’ll receive specific treatment for that condition. 1, 6. ↵ Armitage JO. Approach to the patient with lymphadenopathy and splenomegaly. In: Goldman L, Schafer AI, eds. Goldman’s Cecil Medicine. 25th ed. Philadelphia, PA: Elsevier Saunders; 2016:chap 168. 2. ↵ Goroll AH, May LA, Mulley AG Jr. Primary care medicine: office evaluation and management of the adult patient. 2d ed. Philadelphia: Lippincott, 1987. 4. ↵ Tower RL, Camitta BM. Lymphadenopathy. In: Kliegman RM, Stanton BF, St Geme JW, Schor NF, eds. Nelson Textbook of Pediatrics. 20th ed. Philadelphia, PA: Elsevier; 2016:chap 490. 7. ↵ Pangalis GA, Vassilakopoulos TP, Boussiotis VA, Fessas P. Clinical approach to lymphadenopathy. Semin Oncol 1993; 20:570–82. 11. ↵ Morland B. Lymphadenopathy. Arch Dis Child. 1995;73:476–9. 12, 15. ↵ Slap GB, Brooks JS, Schwartz JS. When to perform biopsies of enlarged peripheral lymph nodes in young patients. JAMA. 1984;252:1321–6. 13, 14. ↵ Fijten GH, Blijham GH. Unexplained lymphadenopathy in family practice. An evaluation of the probability of malignant causes and the effectiveness of physicians’ workup. J Fam Pract. 1988;27:373–6.